HyperSciences CEO Mark Russell wants to use the earth's energy to go to space. To get there, Russell is drilling deeper than ever before in pursuit of fossil fuels. That's because his company, HyperSciences, is funded through Shell's GameChanger program. HyperSciences' product is a high-velocity projectile that Russell hopes will one day help access geothermal energy, a clean, renewable energy source that eventually could replace the oil and gas he's currently seeking. Russell comes from an Idaho mining family that has been breaking through hard mineral deposits for generations. He and his brother, Matt, dug two 11,300-foot-deep holes, the deepest in North America. Growing up in Kellogg, Idaho, and later Spokane Valley, Russell remembers taking apart his toy airplanes and putting rockets in them. He earned his master's in aeronautics and astronautics at Stanford and moved to the Seattle area, where he designed airplanes and spaceships for Boeing and Kistler Aerospace. He then went to work for visionary Jeff Bezos' space exploration project Blue Origin, designing a takeoff and landing vehicle that is now on display in the Museum of Flight. In aerospace, you're either working for a mega-corporation that is doing one specific thing, Russell says, "or you work for a billionaire who has their vision for where they want to take their company in 20 years." Russell launched a rideshare startup called Zebigo in 2010 and received glowing write ups in the Puget Sound Business Journal and GeekWire touting his "former aeronautical engineer" credentials and scientist-heavy team. Ultimately, Russell moved his family back to Spokane to focus on his own vision. HyperSciences General Manager Obie Strickler says he jumped at the chance to work for Russell. "It was really a no brainer," says Strickler, who worked in mining development with Russell for four years. "Continuing to work with a very creative and innovative partner like Mark, he'll continue to innovate and invent new things." 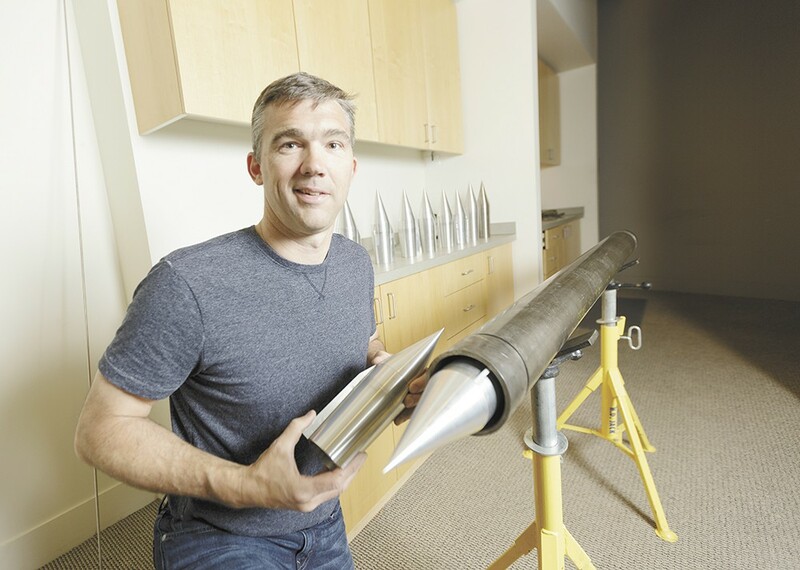 "I wanted to do something very entrepreneurial and try to merge industrial and aerospace, so I came back and worked with the family in Spokane in mining and along the way invented hyperdrill," says Russell. Hyperdrill, a ram-accelerator technology, is based on a late-1980s invention at the University of Washington. Originally intended for defense, it proved too cumbersome and languished somewhere in the UW's research archives for decades. In early 2014 a friend suggested that Russell submit his invention to Shell's GameChanger program. "Early on, I pitched it to Shell as a geothermal drilling solution, because we sit on top of a fantastic nuclear reactor that continues to generate heat due to radioactive decay," says Russell. "The No. 1 issue with accessing that heat is drilling, being able to go to depth and drill. Shell is smart enough to realize that they are an energy company, not just an oil and gas company; they don't want to miss an opportunity to pivot if something comes along." Shell got back to him within 48 hours, Russell says. "They said, 'That sounds great; we don't know a lot about geothermal, we'd like to know more, but we do know about drilling into rock, particularly hard rock, and we have hard-rock problems. If you can get through hard rock like you say you can, that opens up a world of opportunities to us,'" says Russell, who set up a test site in one of his grandfather's abandoned mines east of Sandpoint and got to work. The projectile doesn't frack so much as it pulverizes. Both the rock and the projectile disintegrate on contact. More than 1,000 years before white settlers arrived in the Northwest, Native Americans and their ancestors had harnessed the geothermal energy of the hot springs — bubbling pools of water heated by magma — for cooking and cleaning, according to the U.S. Department of Energy. Today the geothermal pools at Washington's Soap Lake and Sol Duc hot springs serve mainly as tourist attractions, but deeper geothermal energy reserves could figure significantly in our energy future. In 2006 a study conducted by a panel at the Massachusetts Institute of Technology projected that geothermal power could replace our nation's retiring coal power plants. New deep-drilling technology was listed as one of the major barriers to accessing these vast energy troves within the earth's crust. Many countries are already using geothermal. Russell visited a geothermal power plant in Kenya last year and was dazzled by the simplicity of the operation, which required only three workers. Water is injected into magma-heated-rocks and returns to the surface hot; that heat is converted into electricity. Kenya plans to get most of its power this way by 2030. Iceland already uses geothermal energy for most heating needs and more than a quarter of its energy needs. Both nations' reserves are near the surface, so they don't have to drill deep to tap them. When geothermal reserves aren't near the surface, you have to drill, often very deep and through very hard rocks. For geothermal energy to become an economically viable alternative to oil and gas, that drilling has to be done with minimal hassle and expense. Russell is confident that his projectile can do that. As HyperSciences grows, the jobs and economic growth it creates will be in North Idaho and Spokane. Russell currently employs four full-time employees, but expects that to grow to 100 jobs in manufacturing, engineering and sales in years to come. "I outsource my machining locally; it's the right thing to do and it's high-quality stuff," says Russell, gesturing around his office at the many iterations of conical metal projectiles. "Everything you see here has been machined right here in town." Russell hasn't given up any stake in HyperSciences to Shell. The funding, through the GameChangers program, works more like a grant and comes with a mentor and the kind of expertise that you get from 60 years of success in the energy business. Though his geothermal dreams may temporarily be on hold, Russell isn't worried that working with big oil will derail them. "Shell has been very upfront. They say, 'Get us in a position where we can use your technology, but go forth and do with your technology as you see fit,'" says Russell. Russell's financial backing comes from the W Fund — which invests in technology spun out of Washington universities — and from matching funds from private Spokane investors. At a lunch at the Davenport Hotel last week, Spokane's angel investor community was abuzz with excitement about HyperSciences. "I always look for signals: Who else that is credible is affiliated?" says venture capitalist Tom Simpson. "If a reputable company like Shell is devoting time and resources, all things being equal, the fact that Shell is involved is a big plus!"